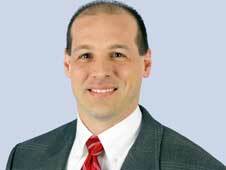 From the Ares I-X mission manager perspective, this is a very exciting time for Ares I-X. All of our hardware is at Kennedy and is being prepared for stacking and launch. Facilities are being modified to accept the vehicle and support it at the launch pad. I can walk right from my office to where all this work is going on and talk to the people that are doing it, and check on progress every day. We are currently performing testing of our instrumentation on the vehicle to ensure that it is working prior to stacking of our hardware into “stacks.” Once the 5 stacks are completed later this summer, we will start assembling those stacks on top of each other in High Bay 3 of the Vehicle Assembly Building. Speaking of the people, our team has been doing an amazing job working through the challenges that inevitably come up during a test flight. We are all proud to set the stage for the future in many ways and to be participating in this one of a kind mission. 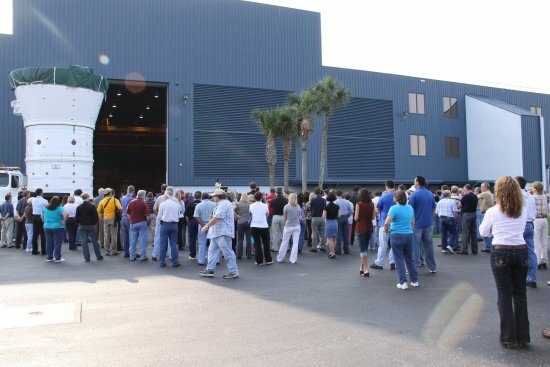 The forward assembly, which is affectionately known around here as the “snow cone,” was rolled out of the Assembly Refurbishment Facility this morning on its way to the Vehicle Assembly Building. Employees and media came out to get a peek at the hardware. 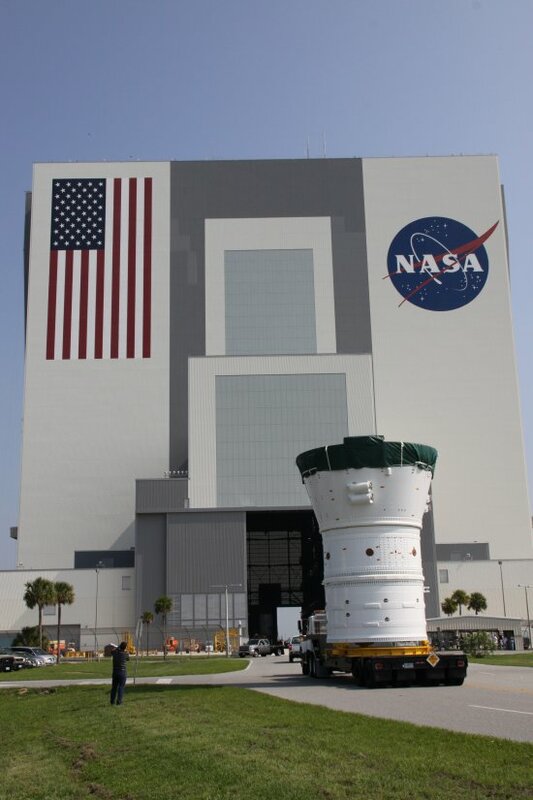 The assembly was rolled into the transfer aisle of the Vehicle Assembly Building, where it will wait to be lifted by crane into the high bay where the upper stage of the rocket is being assembled into its five super stacks. 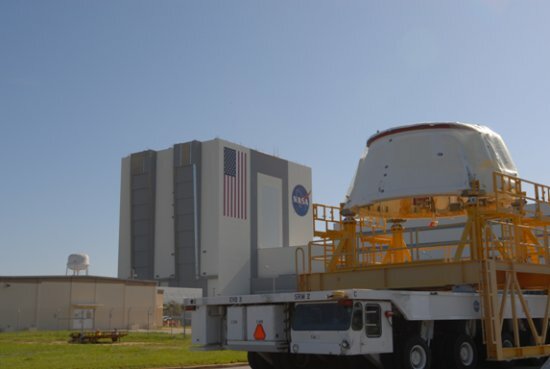 When these stacking operations begin later this month, it will be the first time a new vehicle has been stacked on NASA’s Mobile Launch Platform in more than 25 years! The forward assembly connects the first stage motor segments to the upper stage simulator. Weighing more than 40,000 pounds, the assembly houses three newly designed descent parachutes for first stage recovery. 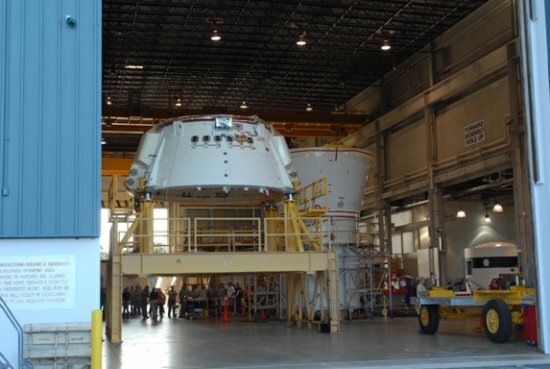 With 300 employees looking on, the Ares I-X aft skirt rolled out of the Assembly Refurbishment Facility. Senior management including Kennedy Center Director Bob Cabana, Mission Manager Bob Ess, ATK Program Manager Joe Oliva and United Space Alliance Associate Program Manager Roger Elliot spoke at the “pep rally” type event. The aft skirt is on its way to the Rotation Processing and Surge Facility where it will be attached to the aft motor segment later this week, forming the aft assembly. Although this was an aft skirt for the shuttle program, the team made many modifications for this new vehicle. Some modifications include adding deceleration and tumble motors, avionics and a controller for the auxiliary power unit. Once the aft assembly is complete, it will be moved to the Vehicle Assembly Building to begin stacking operations in late June.